As most of you know, we were able to send monarchs into space via the shuttle Atlantis on the 16th of November 2009 to be delivered to the International Space Station (ISS) where they lived out their lives. These monarchs are now back in Kansas and will become part of a permanent display at Monarch Watch. The entire venture was a most curious migration, three monarch larvae were sent from Kansas to Florida, delivered to the shuttle Atlantis as part of the payload for mission STS-129 that took them to the ISS. Aboard the ISS they fed on the artificial diet created by Monarch Watch, molting from 4th into 5th instars and into chrysalises, finally becoming adults. The shuttle Endeavour returned our monarchs to Earth on the 21st of February and from there the monarch habitat was shipped to BioServe Space Technologies at the University of Colorado in Boulder – the specialists who coordinate biologically based science experiments for NASA and with whom we worked to get our monarchs into space. BioServe sent the monarchs back to us on the 4th of March 2010, thus completing a most amazing journey. The entire venture, including our engagement with numerous schools, teacher evaluations of the project, photos, videos, and a summary of what we have learned from this project can be found on our Monarchs in Space page. Q: What is the longest distance monarchs have traveled? Q: How far have monarchs traveled in one day? Q: How fast have monarchs traveled? Of course, the questions aren’t framed correctly and this is the case for many questions that come from students and the public. In the classroom the unexpected answer to a poorly worded question can often be used to get students to ask questions that are more incisive and to spark a discussion. Experts will often reframe poorly-worded questions from the public. For example, “How many miles can monarchs cover in one day?”, might become “Assuming you want to know the maximum distance monarchs have been recorded to move from one day to the next, the answer is more than 150 miles.” Or, to provide an answer that is more revealing to the audience, experts may turn the question back on the questioner and ask, “Do you mean by powered flight or do you want to know how far they can advance on weather fronts in a day or two or do you want to know the average speed of flight or average rate of progression of the migration?” The answers to these questions lead to a better understanding of the dynamics of the migration. If you don’t know the answers to these and related questions, you might refer to the Monarch Watch Press Briefings. These questions often turn up in press interviews and we’ve summarized the answers in this text. 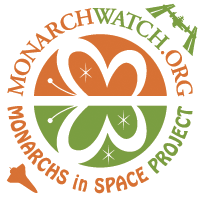 So, will there be another Monarchs in Space project?” We don’t know – but wow, this sure was fun! We do have plans to recreate this project here on Earth and will soon have monarch kits designed to allow students to follow the development of monarch larvae in their classrooms and to compare their results with those established for monarchs aboard the International Space Station. Stay tuned! * The three monarchs left the Earth on 16 November 2009 at 1:28p EST and returned approximately 2337 hours later, on 21 February 2010 at 10:20p EST. At an average speed of 17,210 mph that would make the Lawrence-to-Lawrence journey approximately 40.2 million miles. The Lawrence to Florida and Florida to Colorado to Lawrence portion of the trip doesn’t add much to the overall total. Wow, You all are just great at Monarch Watch! This has been a lifetime experience for my students and me. We’ll never forget the astropillars STS 129 and our connection to the celestial skies with the ISS. After our last Monarch the end of January. He lived about 5 weeks in a large cage with plenty of gatorade and constant 72 degrees temperature) we continued the study by building models of the ISS out of recycled items. 3rd. graders made Culture Kits spotlighting the 13 countries who contributed to the creation of the ISS. 4th. and 5th. graders are now doing independent research. Some are questioning the thought of the Shuttle mission being mothballed. Yes, please continue MOnarchs in Space, somehow, someway, somewhere…… I can’t wait to get out poster and memorabilia. Wow, You all are just great at Monarch Watch! This has been a lifetime experience for my students and me. We’ll never forget the astropillars STS 129 and our connection to the celestial skies with the ISS. After our last Monarch expired at the end of January. He lived about 5 weeks in a large cage with plenty of gatorade and constant 72 degrees temperature) we continued the study by building models of the ISS out of recycled items. 3rd. graders made Culture Kits spotlighting the 13 countries who contributed to the creation of the ISS. 4th. and 5th. graders are now doing independent research. Some are questioning the thought of the Shuttle mission being mothballed. Yes, please continue MOnarchs in Space, somehow, someway, somewhere…… I can’t wait to get our poster and memorabilia. yes. i can’t wait, either. Those monarchs desrve to be crowned. They are my heroes!